I just suppressed the urge to insert the word ’countdown’ into the headline. See what I’m doing here? We have four more polls by Allensbach and Forsa (published on Tuesday), and by FGW and GMS (published on Thursday), and presumably, these are the last that we are going to see before election day. Do they change the story? First, let’s note that FGW has the very latest data: they interviewed on Wednesday and Thursday and published the results immediately. A very short fieldwork period raises issues of representativeness, but they have been in the business for about 40 years now, so let us assume they know what they are doing, shall we? 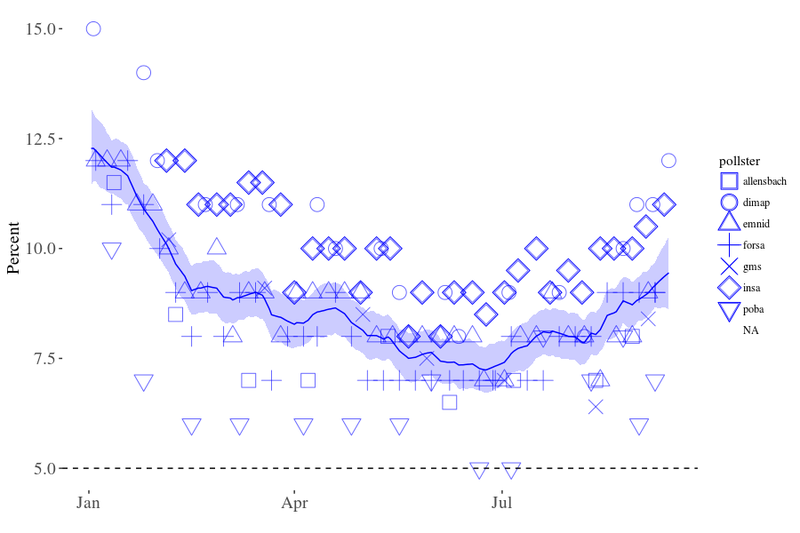 Second, unlike most pollsters, FGW always publishes both raw (but presumably weighted) data (what they call the political mood) and estimates that take into account party identification and other long-term factors (their ’projection’). So far, I have always used the former, but we have reached the point where the forecast becomes the nowcast, and so the only thing we get this time is their projection, which I treat like if they were raw data, using last week numbers of undecided and non-voters (both not very realistic, I suppose). 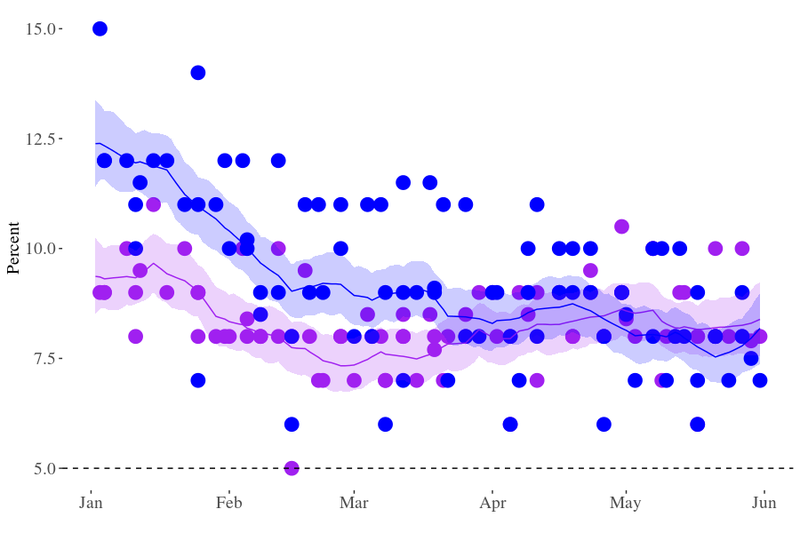 GSM was in the field from Thursday last week until Wednesday, but because I peg every poll to the mid-point of their fieldwork, their data are three days older than FGW’s for modelling purposes. Things get bit confusing then: Forsa were in the field from September 11 to September 15, and Allensbach even from September 6 to September 14, but then sat on their data. So their findings came out on Tuesday but are less recent than the Insa poll I talked about last time round. 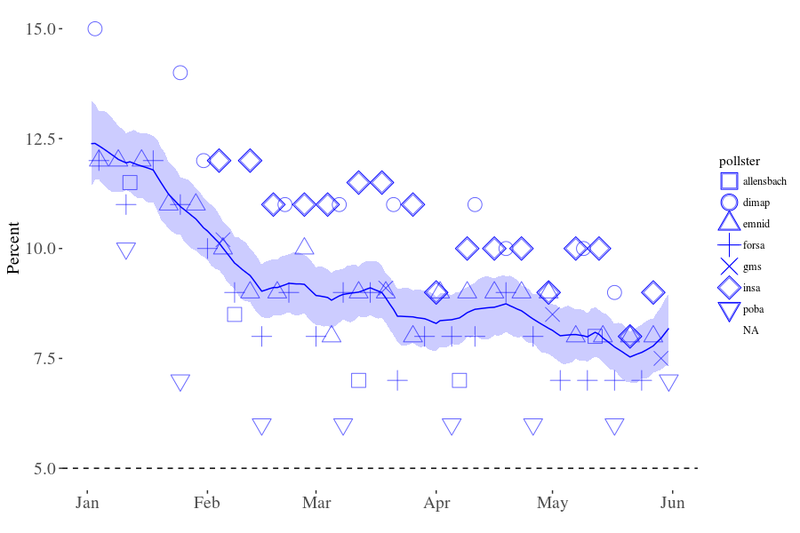 In other words: By putting this information in the model, I’m adjusting our estimate of where public opinion was a week ago, which then feeds into my guess where it is right now (or rather where it was two days ago). It’s a good thing that this is almost over. Ok, I succumbed. Couldn’t resist. etc. Support for the Christian Democrats has further declined. The last estimate is 35 per cent [34-37], which would be six points less than in 2013. But the Social Democrats are down, too. 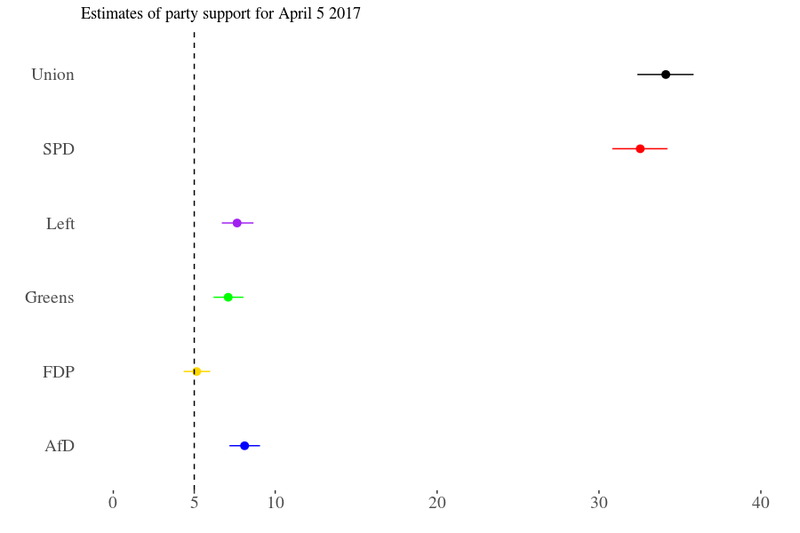 The estimate for their current level of support is 22 per cent [21-23], so the CDU/CSU’s lead is still 14 points [12-16]. 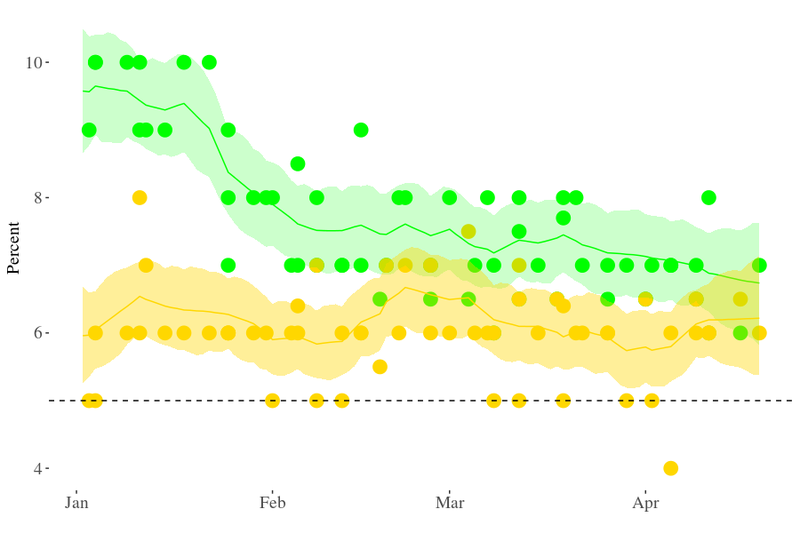 If there is a last-minute rush towards the FDP, it’s not reflected in the polls. But the party (not currently in parliament) is doing well, and much better than a few months ago when it was far from certain that they would return to federal politics. 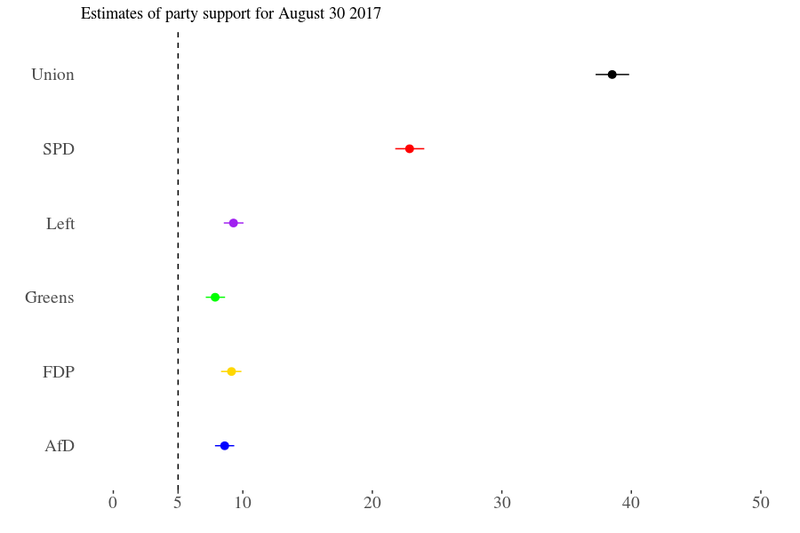 Estimated support for them is 9 per cent[9-10], which puts them ever so slightly ahead of the Greens (8 per cent [7-9]. Is the AfD finally pulling ahead of the Left? After going to great lengths to explain why the race for 3rd place is irrelevant and how the Left is better positioned to win it anyway, the AfD is finally pulling (or rather inching) ahead. 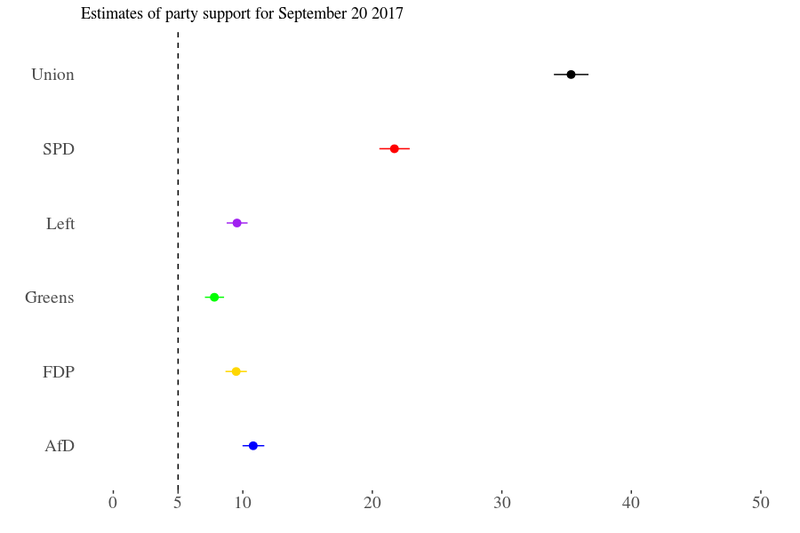 The final estimate for their current support is 11 per cent [10-12] (which would be a far cry from the levels of support they enjoyed in 2016), while the Left is put at 10 per cent [9-10]. With the four new polls factored in, the chance of the AfD coming third is now a whopping 96 per cent. The size of their likely lead is a single point [0-2.4]. The two most likely outcomes remain a continuation of the Grand Coalition (not necessarily in the best interest of the SPD), or a Jamaica coalition (if the FDP and the CSU and the Greens can work together). Interesting times ahead. Third, they are broadly in line with the last (Friday) set of estimates. Of course, that does not mean that the pollsters have it right. It just means that public opinion as measured by the various survey houses seems to be rather stable at the moment. Support for the Christian Democrats has been flagging recently, but they still have a solid lead of about 14 points over the Social Democrats. The credible interval for the gap is 13-16 per cent. The current estimate for the Christian Democrats is 37 per cent [36-38], which would make them the strongest party by far but would also imply a substantial loss compared to their result in the 2013 election (41.5%). The estimate for the SPD is 23 per cent [21-24], which is virtually identical to their worst ever result (in 2009). Speaking of virtual, it seems virtually impossible that these two minor parties will not clear the electoral hurdle. Then again, look at what happened in 2013. 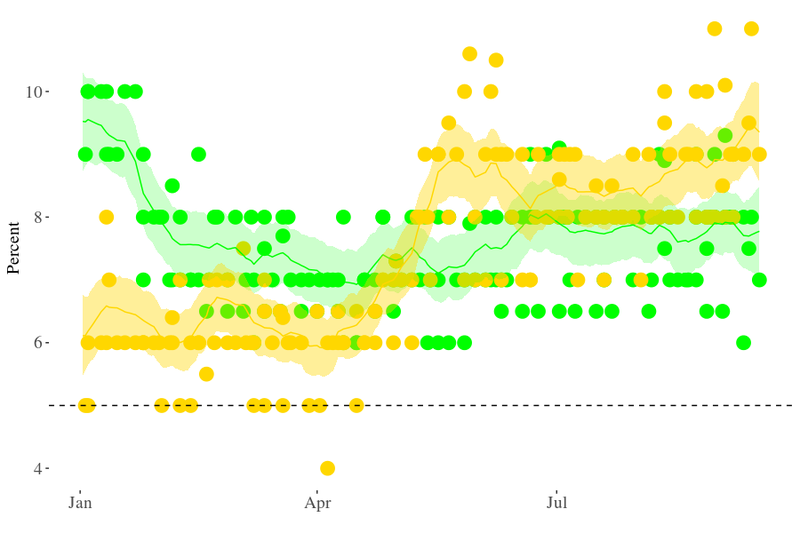 Right now, the FDP is ever so slightly ahead of the Greens, but the enormous attention they are currently getting from the chattering classes is not (yet?) reflected in the polls. Either way, their likely return from the electoral dead would be a significant event in German politics. 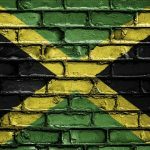 After factoring in the three latest polls, the options remain essentially the same: In all simulations there is a majority for both a Grand Coalition and a Jamaica arrangement. There is also tiny (0.5%) chance of a centre-right (CDU/CSU + FDP) coalition. If the polls are correct, nothing else will work. As I said before: Move on. Not much to see here. State of the German polls: Is the SPD doomed and the AfD headed for third place? Once more, repeat after me: It’s just a single poll. It’s also the time for horse-race journalism (and for horse-race blogging). In this specific case, the single poll is the most recent instalment of the “Deutschlandtrend”, a survey-series that Infratest-dimap runs for public broadcasting giant ARD. From the results (SPD: 20, AfD: 12), Focus Online has created a lovely headline: SPD in freefall, AfD at highest level of support in seven months. But is there really a story? Now for the horse-race blogging. 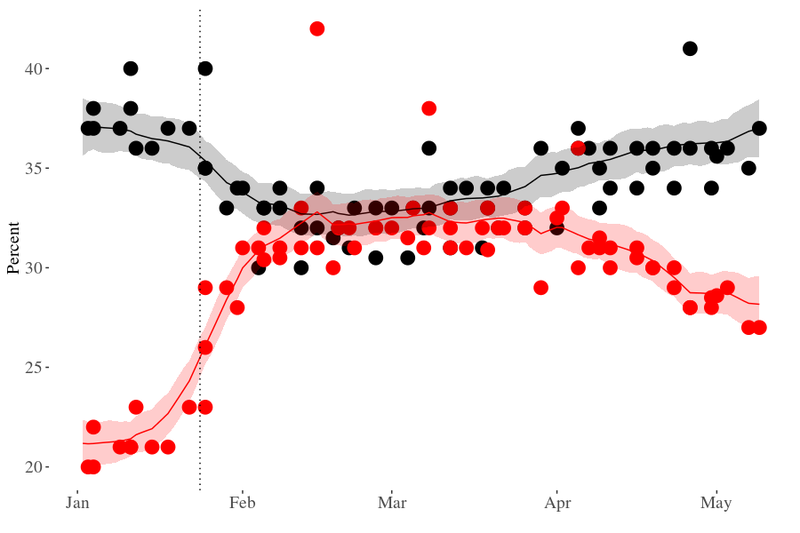 Since my last blog (day before yesterday), three new polls have been published. Why bother to start the big and mysterious poll-pooling machine again? Because I can, because in a week or so, there will be no new polls, and because I want to see if there is anything to the Focus story. All Infratest-dimap polls (the hollow circles) put the AfD well above the model-based credible interval, and this one (the rightmost circle) is particularly far away from the envelope. The current credible interval for the AfD is 8.6-10.3%. 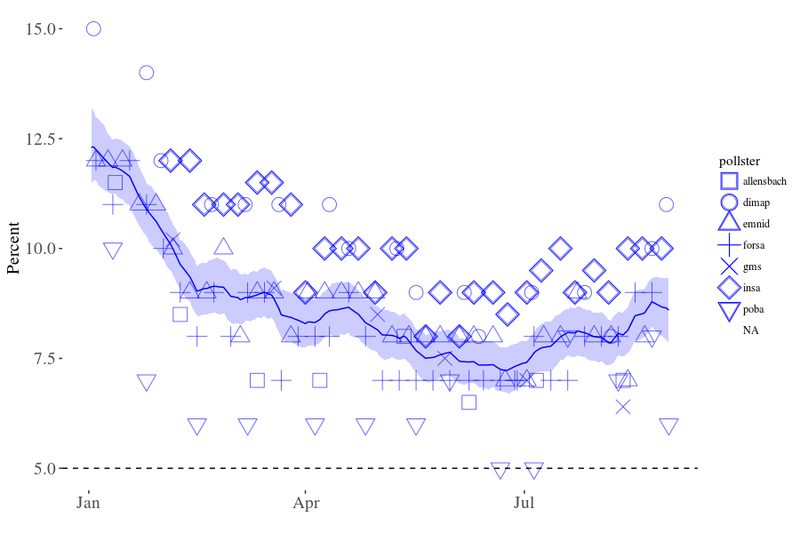 The AfD’s mini-upward trend may be real, but this poll is probably exaggerating the development. 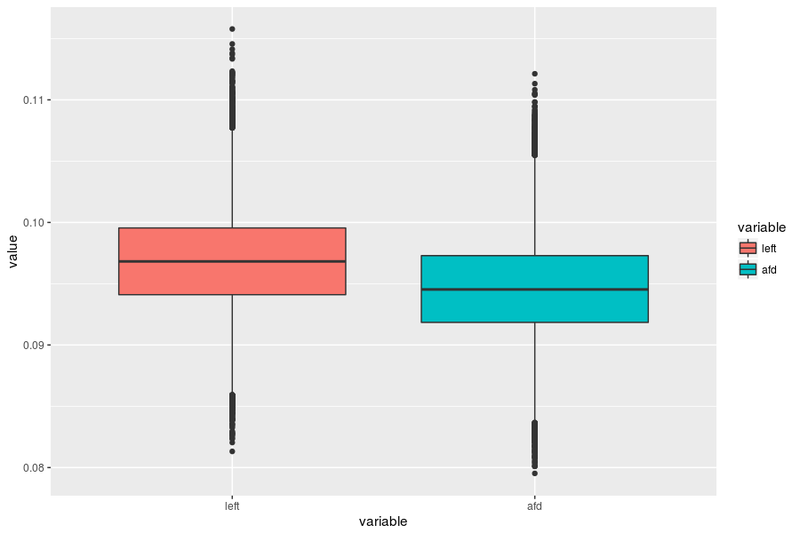 Infratest-dimap may also underestimate support for the SPD. 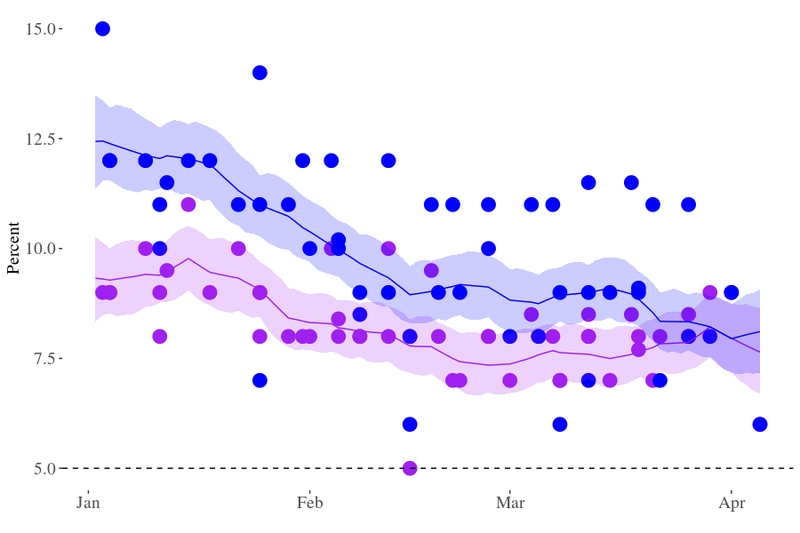 The model currently puts the SPD between 21.4% and 23.6%. 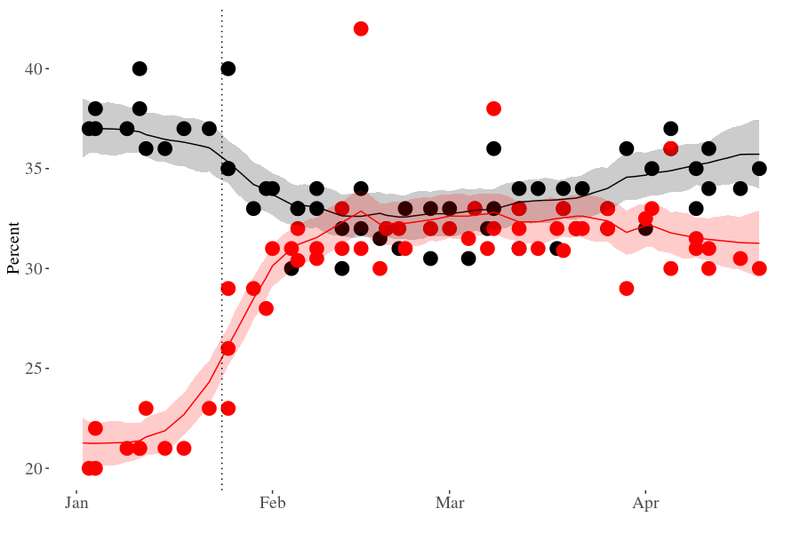 The Infratest-dimap poll (rightmost filled red circle) is well below the credible interval. Things don’t look great, but it’s not “freefall”. The credible interval for the gap between the the SPD and the AfD is 11.6-14.6 points, so the 8 point gap reported by Focus on the basis of a single poll looks like a bit of an over-dramatisation. 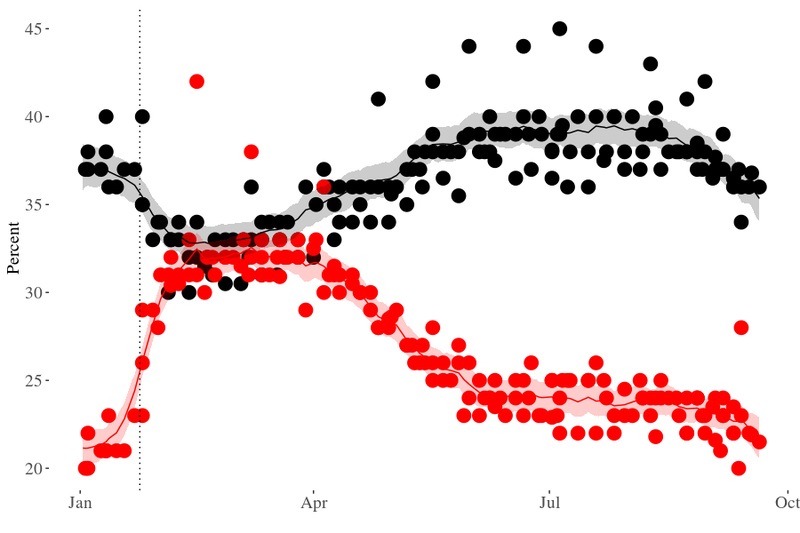 The AfD is not (yet) catching up with the Social Democrats. Will the AfD be Germany’s third party? In the model-based simulations, their chances have gone up from 18% to 39%, but that is still far from certain.In actual fact, according to the model, the Left has a better chance (50%) to become the largest of the minor parties. But that would be a far less dramatic story. And realistically, this is all by the by: the four minor parties enjoy virtually identical levels of support. Coalition options are the same as they were three days ago. So what is the bottom line? This last poll (and the other two) make good headlines, but in terms of likely politically relevant outcomes, the situation has not changed at all. With less than two weeks until the election, we now have 153 surveys from seven different companies to pore over. The bulk of these (104) were produced by Emnid, Forsa and Insa. GMS and Allensbach have delivered only a handful of polls (seven and nine, respectively), while FGW (15) and Dimap (18) occupy the middle ground. 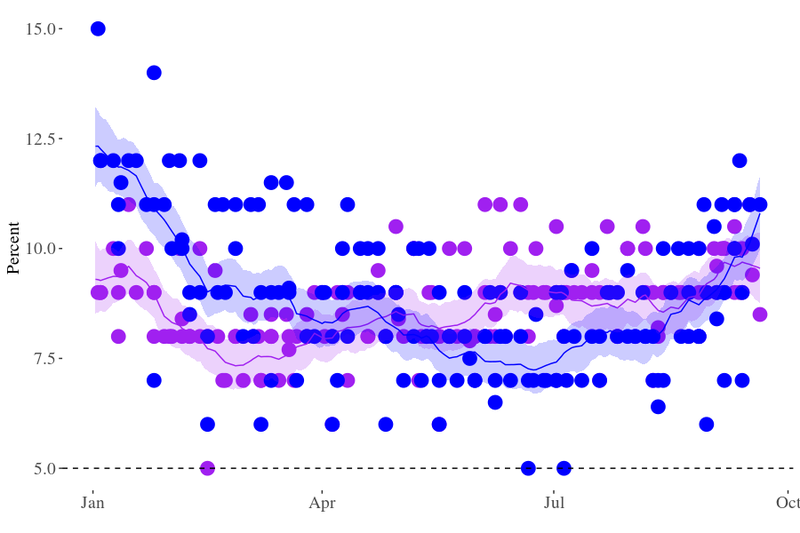 Although this is the so-called “hot phase” of the campaign, with TV debates, tours of the country and whatnot, there is still very little movement in the (averaged) results. Unless my model is filtering out too much noise, or the polls are off, which are two entirely plausible and not mutually exclusive ideas. 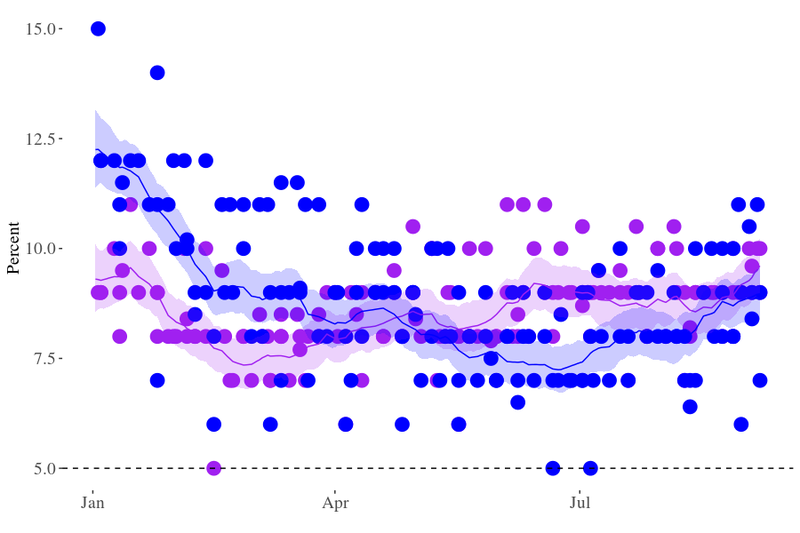 Estimates for both parties have shown an upward trend for the last couple of weeks, but the gains are very moderate (a point apiece or so), and given the credible intervals, the movement is not necessarily real. 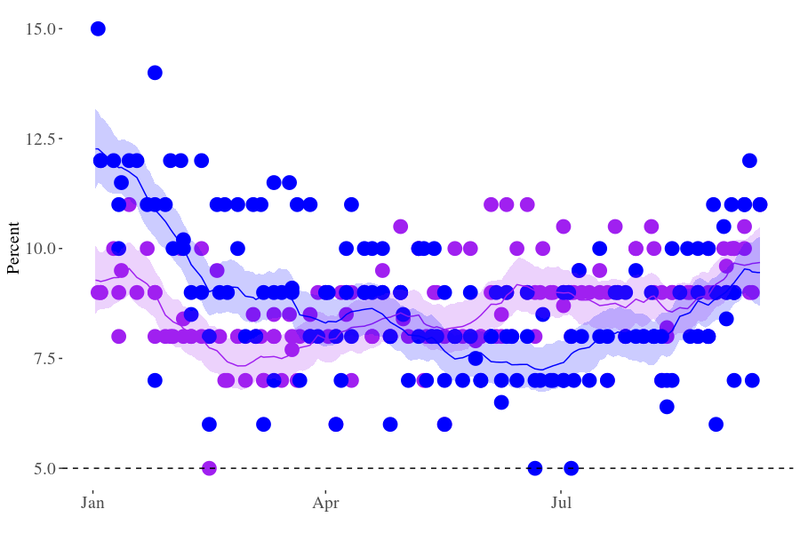 But the AfD is probably doing a bit better than they did in late June, which marked their low point during the campaign. The tiniest of declines for the major parties. Conversely, support for the two major parties may have fallen a bit. But the credible interval for the Christian Democrats is particularly wide because there is a lot of variation in their results, whereas numbers for the SPD are all very close to the credible envelope. Spare a thought for them: It’s abundantly clear that even with their recent relative weakness, the CDU/CSU are much stronger than the Social Democrats. With about a fortnight to go (polls are published with a delay, and the model assigns each poll a notional date in the middle of the actual field phase) and many postal votes already cast, the overall picture looks very much like it has for weeks now. Support for all four minor parties is virtually identical and above the electoral threshold. The SPD is hovering somewhere between 20 and 25 per cent, while the Christian Democrats are located somewhere in the high thirties. The Guardian may daydream about a black-green coalition, but that is not very plausible at the moment: not in a single one of 60,000 simulated outcomes would such a coalition achieve a majority. Obviously, a red-green coalition is even less probable, and a red-red-green majority is out of the question, too. 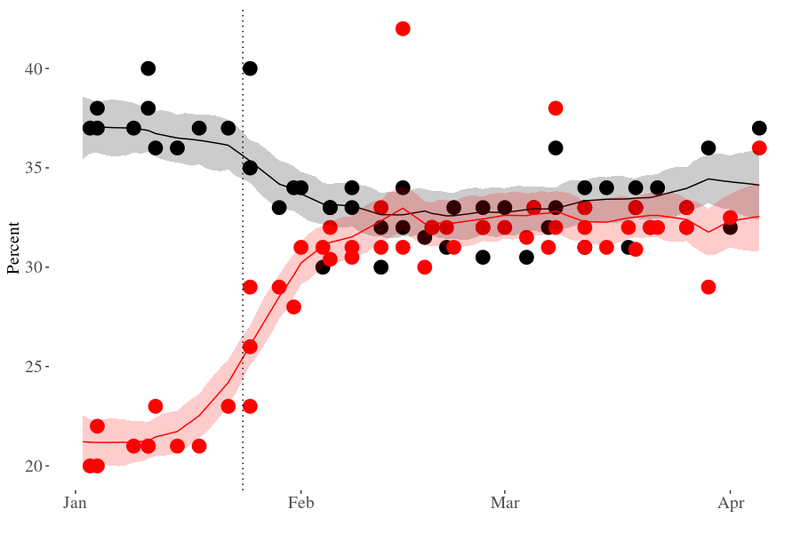 Nine days ago, there was at least a chance (23%) of a traditional centre-right majority, but with the (moderate) decline in support for the Christian Democrats, this looks highly unlikely (0.1%) now. However, both a “Jamaica” coalition and a Grand coalition are feasible in all simulations. So once more, a fourth term for Merkel seems to be inevitable. 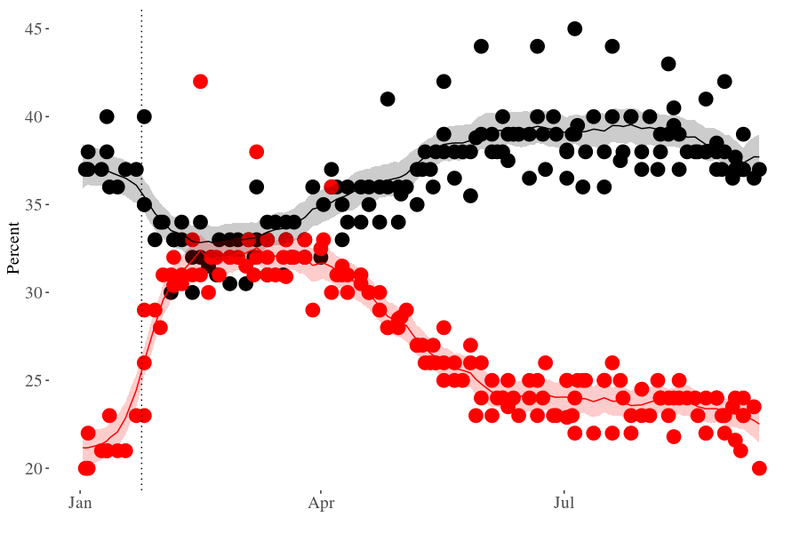 While I was doing other stuff, elsewhere, the German polling industry has been busy. Over the last eight months, the big seven have published results from 144 surveys with a total of 266,715 respondents. With just three weeks to go until election day (and postal voting well underway, what can they tell us? Much in line with the tenor of the international press, a British journalist asked me the other day how the AfD had managed to “bounce back”. Well, they have not. The height of their popularity was arguably in 2015/16, when they were solidly in double-digit territory for a while. 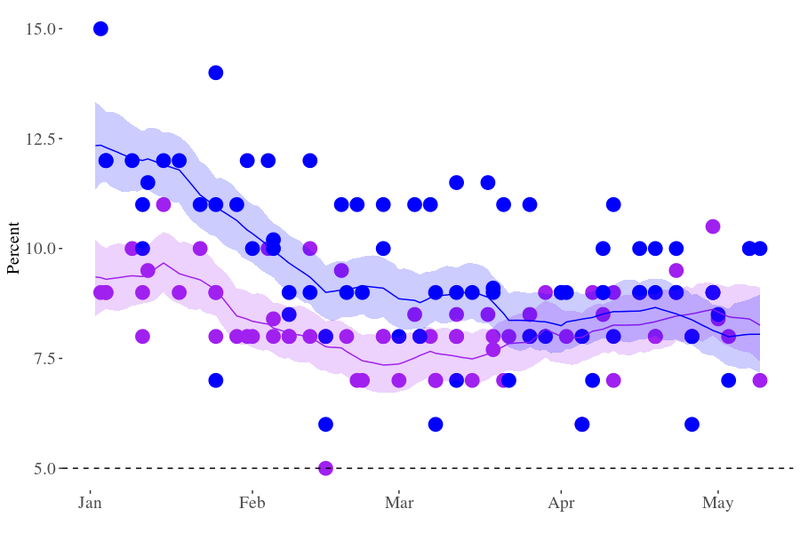 Since the beginning of the long campaign in January (when the AfD did better than now), they have been stuck between seven and ten per cent in the polls. This pattern still holds. The AfD gets 10/11 per cent in two recent polls, but these were conducted by companies that tend to produce rather high estimates for the party’s support. In other equally recent polls, companies that tend to give lower estimates for the AfD put them at nine / eight per cent, respectively. 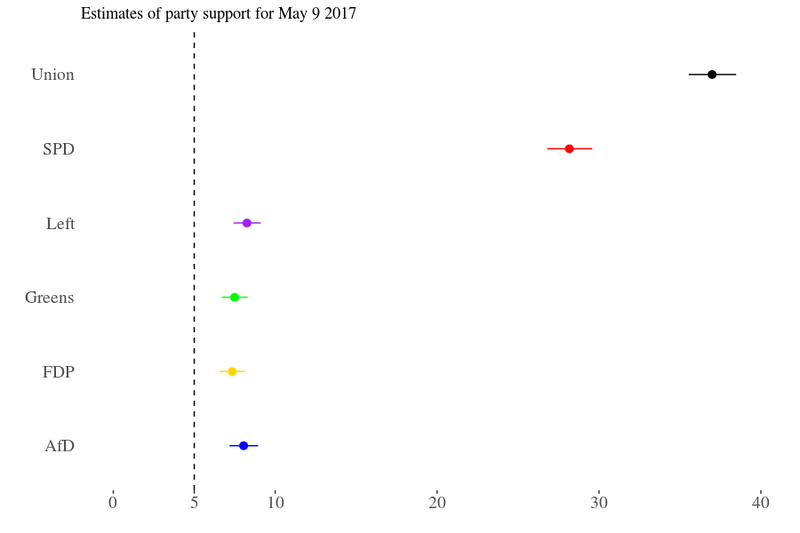 Unsurprisingly, the credible interval for current AfD support ranges from 7.8 to 9.3 per cent. Another object of rather intense media focus has been the question whether the AfD will be Germany’s third-strongest party on September 24. The aggregation model is not sure: In 10,645 of 60,000 simulated outcomes of the election, the AfD is the strongest of the minor parties. That’s 18 per cent of all runs, which roughly translates to “rather not”. Either way, the question is quite irrelevant. The real issue here is that all minor parties enjoy very similar levels of support. If this support translates into real votes, there will be four minor parties in parliament, and coalition building is going to be a difficult, but not impossible (see below). Long gone are the days of the “Schulz Effect”, this dreamy moment early in the campaign when support for the SPD and the Christian Democrats became indistinguishable. 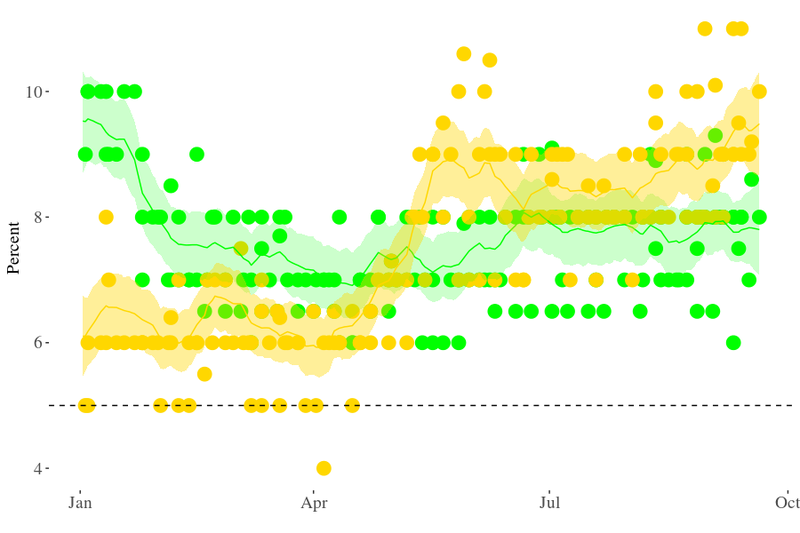 For weeks on end, the CDU/CSU have been roughly 15 percentage points ahead of the SPD. One must admire the dedication of the SPD’s campaigners, but closing that gap looks like a very unlikely feat. While tactical voting can mess with support for the FDP (that’s the way I burnt my fingers four years ago), not a single simulation out of 60,000 suggests that the FDP will remain below the electoral threshold. All four minor parties are currently well above the electoral threshold, and their respective levels of support are indistinguishable. Take that, media people. In terms of possible coalitions, that means (amongst other things) that right now, there is no chance for a leftist (red-red-green) government: the combined vote share for the three left parties is in the range of 39-41 per cent. This implies that there is no majority for an SPD/Green coalition, too. There is also no majority for a “traffic light” (SPD/Green/FDP) government. In sum, on current polling the probability of an SPD-led coalition (and hence the probability of a Schulz chancellorship) is nil. But there is a not-too-shabby chance for a traditional centre-right coalition. Thanks to the strong support for the Christian Democrats, the CDU/CSU and the FDP have a (narrow) majority in 23 per cent of the simulations. A “Jamaica” (CDU/CSU+FDP+Greens) coalition would have a solid majority in all of the simulations. And of course, there is always the prospect of yet another Not-so-Grand coalition. So it looks that I was right to sell in May and go away: If the polls reflect the reality of German politics, and if that reality remains reasonable stable for another three weeks, there are 2.23 viable coalitions that would be led by Angela Merkel, and not a single one that would be headed by Martin Schulz. It is four and half months until the September election, and things are getting a little more interesting. Everyone around here is happy that Macron saved the EU and defeated populism in one fell swoop (or maybe not), but I still love a nice parochial state election. And we had a good one: Last Sunday, the small northern state of Schleswig-Holstein went to the polls. The current coalition (SPD, Greens, and the Danish/Frisian minority party SSW) is unusual enough, and they lost their majority of a single seat. The CDU won a bit, the SPD lost a bit more, but for them, it’s a disaster since expectations were high (Schulz effect, anyone?). The Left and the Pirates are out, and both the Greens and the FDP are in double digit territory. Certainly, this is not a federal trend. The AfD made into the Landtag for the 12th (?) time in a row, but barely (5.9%). Further to the south, North Rhine-Westphalia will have its own election on next Sunday. 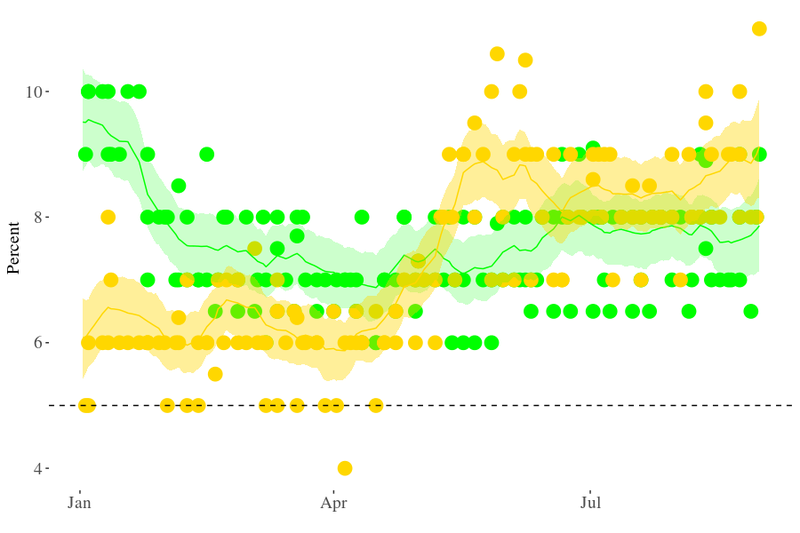 Here, the red-green coalition is in trouble, because the Greens are doing very poorly, and SPD support is lacklustre. The CDU, which has been trailing the SPD for a long time, is catching up, and both the AfD and the FDP are doing ok, though not great. It’s not quite clear if the Left will make it, and the Pirates (remember?) seem poised to lose their last delegation in a state parliament. What ever happens here will inevitably been read as a bellwether, because of the state’s size (it is home to almost a quarter of Germany’s population), and because it is the last state election before the federal election. Meanwhile, 13 surveys that poll federal voting intentions have been published. 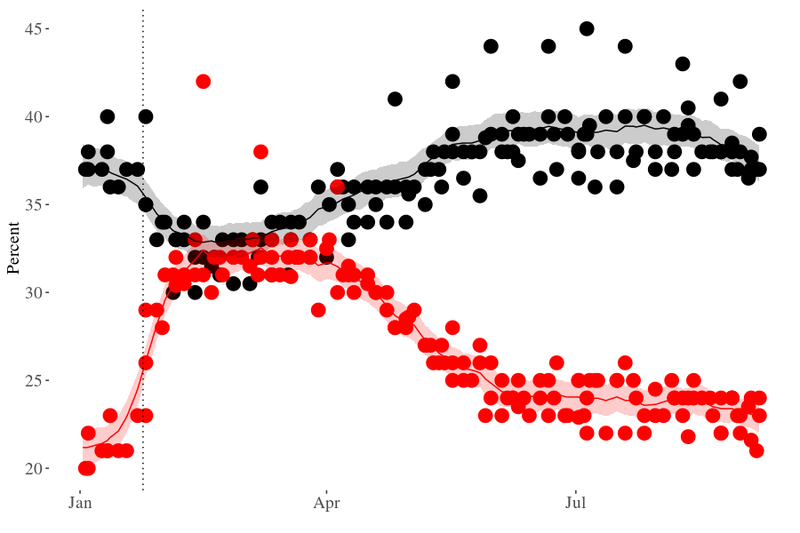 Taken together, there are now 17 polls to track the developments in April (and several that already extend into the first weeks of May). Ever so slowly, the CDU/CSU have managed to pull ahead of the SPD. The Christian Democrats now stand at about 36 per cent. While this makes them the strongest party by far, they polled about 40 per cent four years ago at the same point in the cycle. 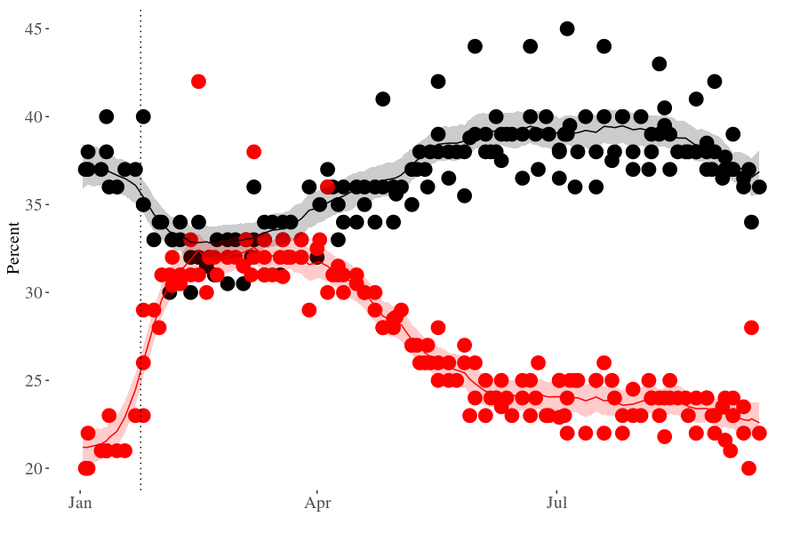 For the SPD, the famous Schulz effect has worn off a bit. April was a slow dive that has probably taken them below the 30 per cent threshold once more. While they are still doing much better than they did in January, their support has declined considerably over the last six weeks. 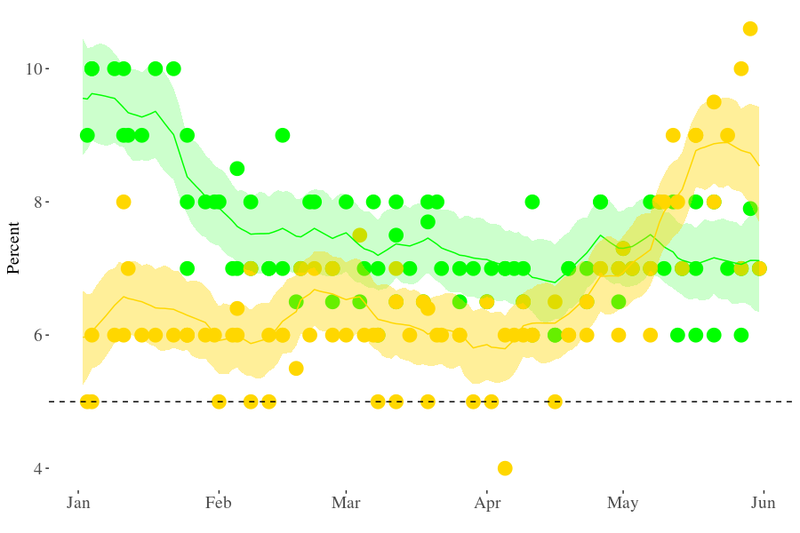 The Greens, on the other hand, have probably moved up in April, but only by about a point. Compared to where they stood a quarter ago, they are still performing poorly. 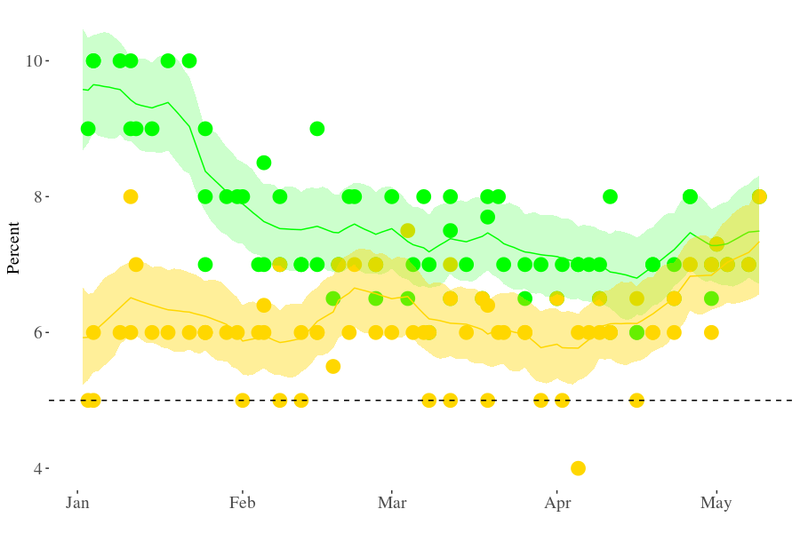 The FDP may have gained a point, too, and are now indistinguishable from the Greens: they both hover somewhere just below eight per cent. 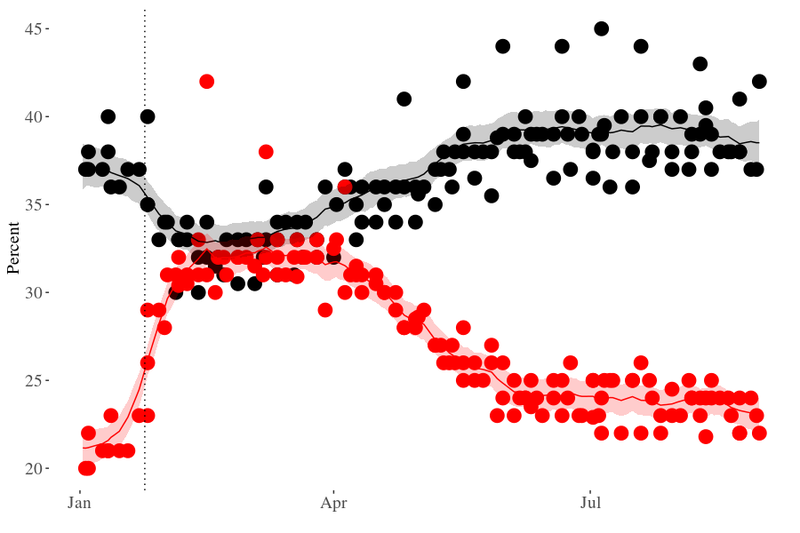 Scandals and quarrels on the one hand (AfD) and non-events (the Left) on the other not withstanding, both parties have remained exactly where they were all through April: tied, and between eight and nine per cent. Move on, nothing to see here. 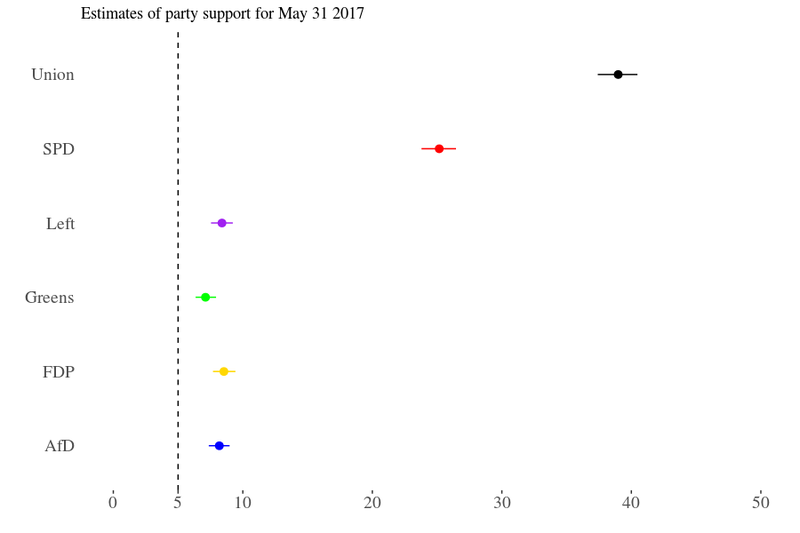 On the last day of polling so far (May 9), support for all four minor parties is statistically indistinguishable, and they are all safely (though not comfortably) above the electoral threshold. The gap between the major parties is quite pronounced at 8 points (the largest difference in months), with a credible interval of 6-11 points. Given the weakness of the SPD and the strength of the Christian Democrats, it is hardly surprising that the simulated probability of a red-red-green majority – hotly debated only a two months ago – is zero. The same goes for the “traffic light” option. Let us not even contemplate the prospects for a red-green majority. But due to the strength of the AfD, a centre-right coalition would also have no majority, CDU recovery or not. Conversely, the probability of a Jamaica (CDU/CSU + FDP + Greens) majority is 99.9%. Put differently, on current levels of polling, every viable coalition would be led by the CDU, and Merkel would have a choice between a) continuing an unhappy marriage with a spouse that wants out or b) entering a risky but also exciting ménage à trois. Which just goes to prove the point that it is impossible to do political analysis without resorting to tiresome sexualised metaphors. … my true love gave to me: two Dimap polls, two Forsa polls, two INSA polls, one Emnid poll, and one FGW poll. So the total number of polls in the database stands at 59 now. Not too shabby. However, three companies dominate the pool: Insa (11), Emnid (15), and Forsa (15). 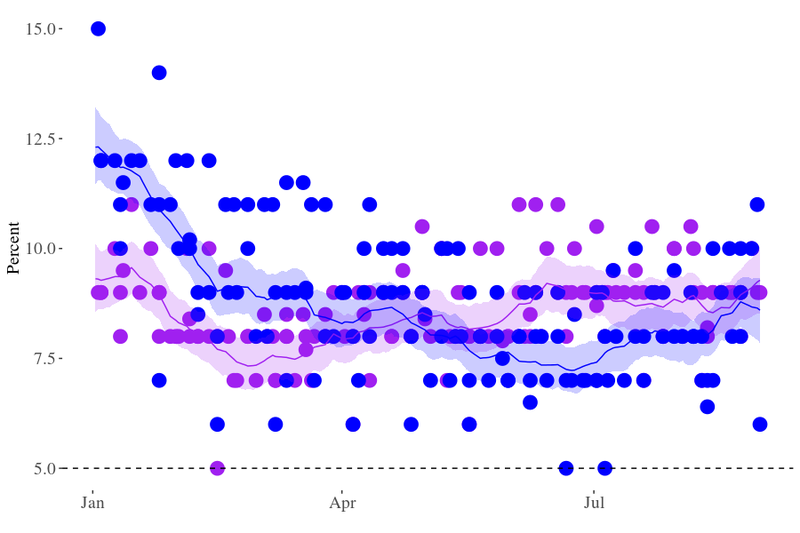 It would be good to have more polls from Allensbach, Dimap, FGW, and GMS. Following the surprise candidacy of Martin Schulz, the SPD made enormous strides, and the two major parties have been neck-on-neck for more than two months. But over the last couple of weeks, the Christian Democrats finally managed to regain a lead over their current coalition partner, although it is a tenuous one compared to their previous standing in the polls. For April 18, the model estimates support for the Christian Democrats at 36 per cent (with a 34-37 per cent credible interval), and support for the SPD at 31 per cent (CI: 30-33). 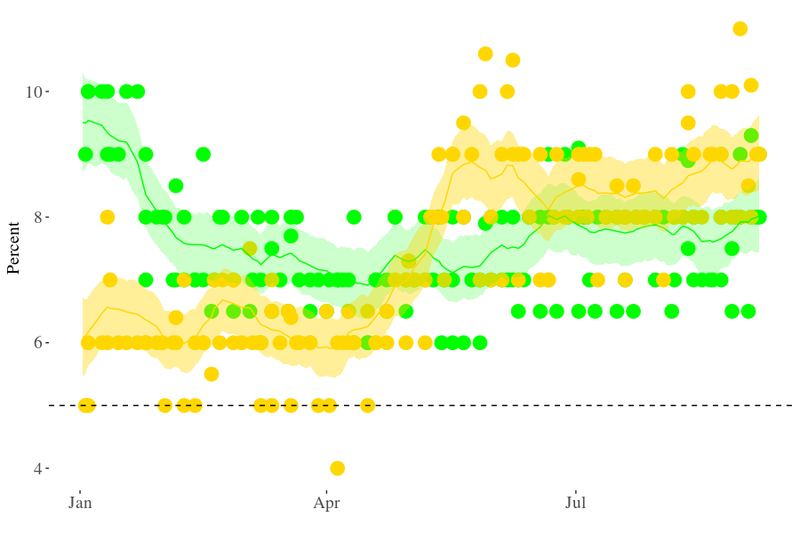 The Greens have not recovered from the drop they suffered in January. 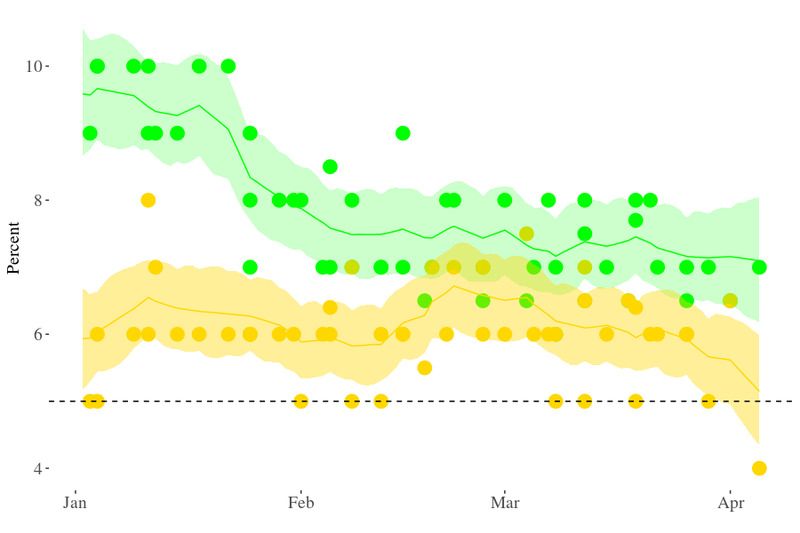 Quite to the contrary, support for them seems to have fallen a bit further during the last four weeks or so. But this movement is well within the margin of error. 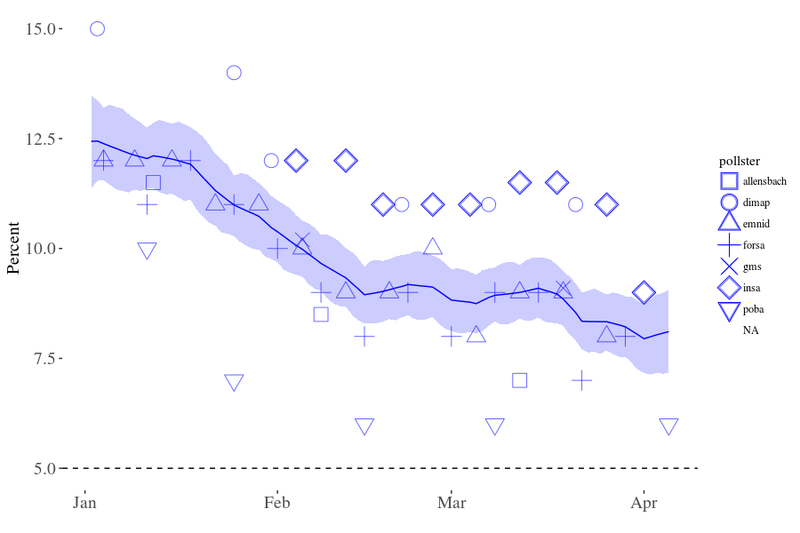 The FDP, on the other hand, may have recovered a little bit, but again, they are still within the CI they were two, four, or even eight weeks ago. Statistically speaking, support for both parties is indistinguishable at the moment. And the same goes for the Left and the AfD. Support for both parties is estimated at 8 per cent, with a 7-9 per cent credible interval. Infighting within the AfD has reached new heights (lows? 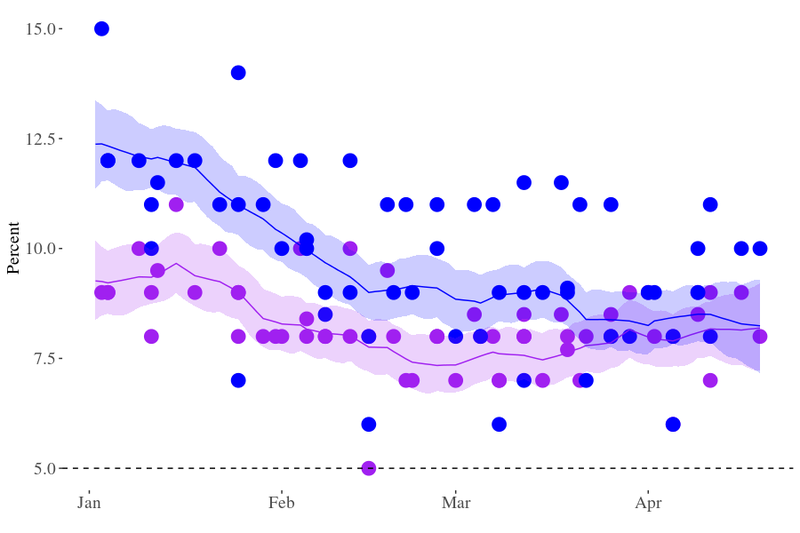 ), and the party may even split again (by the way, I’m really looking forward to the Hunger Games of this weekend’s party conference), but so far, this has had relatively little effect on their polling results, which are still within the (lower) bound of the credible intervals for March. 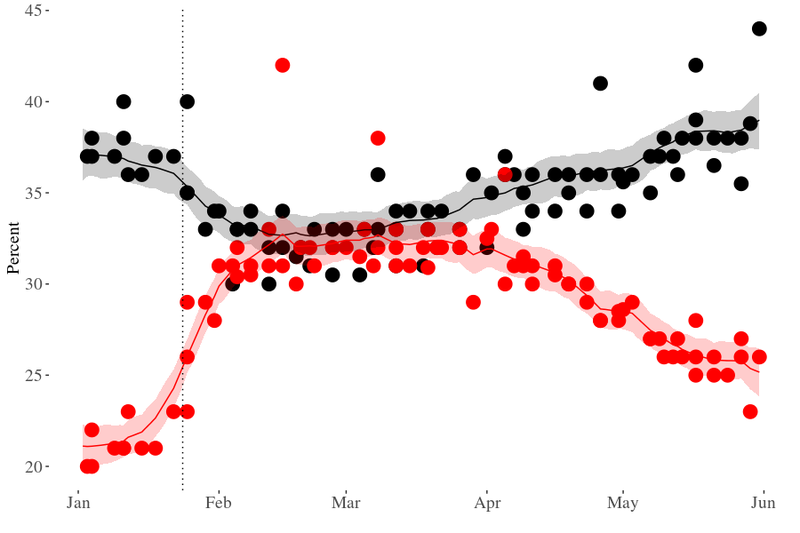 Conversely, support for the Left may have risen a bit but is still within the (upper) bound of their credible interval for March. 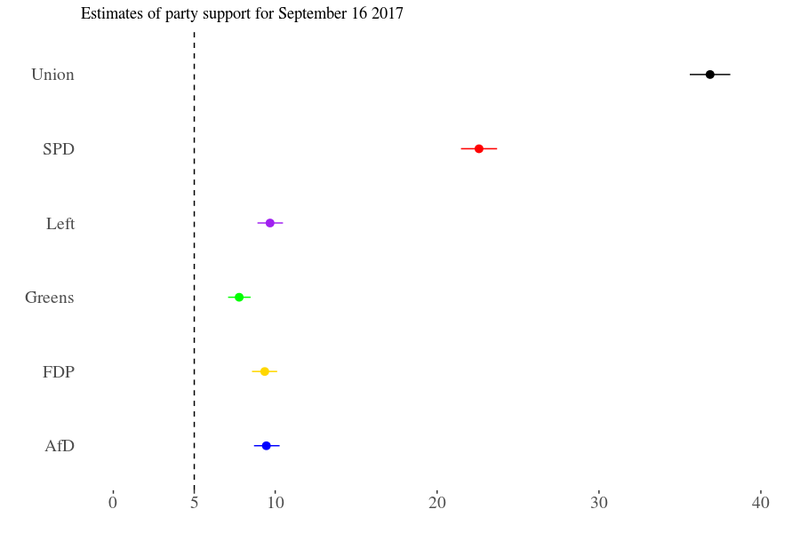 From this final graph, it is clear that the credible intervals for all four minor parties overlap at the moment: in all likelihood, they are all somewhere above the electoral threshold and below the ten per cent mark, but there is insufficient evidence for determining how exactly voters rank them at the moment. For the two major parties, the uncertainty regarding the exact levels of their support is even larger, but the probability that the Christian Democrats are enjoying higher levels of support than the SPD is more than 99 per cent. However, due to the uncertainty about the parties’ standing, the uncertainty regarding the size of this gap is substantial: the credible intervals stretches from 2 to 7 per cent. 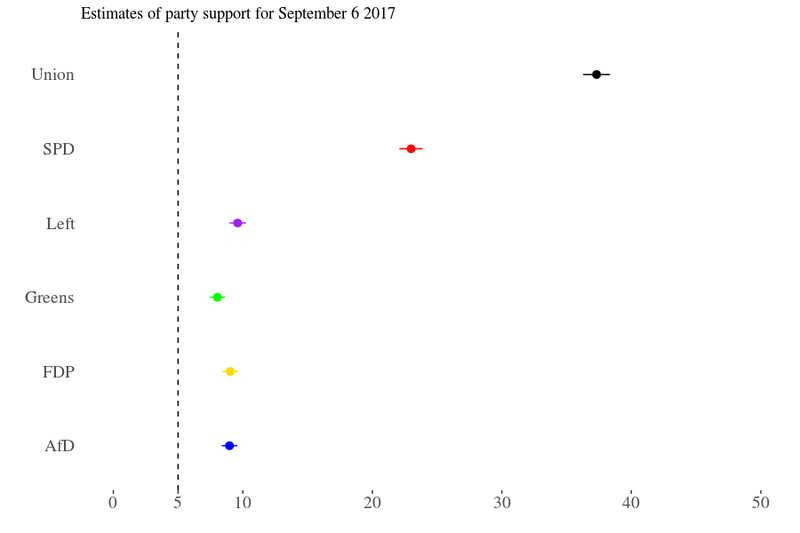 Given these estimated levels of support, neither a “civic” (FDP/Christian Democrats) nor a classic leftist (SPD/Green) coalition would be possible. As a consequence of the Christian Democrats’ rising popularity, even a red-red-green coalition would be possible in fewer than 2 per cent of the simulated draws from the posterior joint distribution. A “Jamaica” coalition of Christian Democrats, FDP, and Greens, on the other hand, would command a parliamentary majority in 71 per cent of the simulations. Having a choice between two coalitions would obiously strengthen Merkel’s hand considerably. But once more, remember that these are not predictions but rather (hopefully) plausible estimates of the current state of public opinion.